In the modern era, evidence-based dentistry has become the standard by which decisions are made and outcomes measured. The use of rubber gloves during surgery first began in the late part of the 19th century. The surgical gloves, initially made of rubber, were first manufactured by the Goodyear Rubber Company for Dr. William Stewart Halstead in 1890 to protect an “unusually efficient” nurse from mercuric chloride dermatitis (not the patient from an infection). Infection rates in medical as well as surgical wards came down drastically after the observations of Joseph Lister (1860) that aseptic techniques like washing hands before as well as after examining patients were followed in many hospitals in the late 1800s. By the 70s of the last century, wearing of surgical gloves became mandatory in many developed countries even for examining patients. By the 90s, surgical gloves were the norm in many countries, including developing ones. Surgical gloves are normally worn for surgical procedures to maintain sterility during the procedure to minimize postsurgical infections. Dental extractions, in the past, were performed with bare hands with a limited risk of infection. In 1987, the American Dental Association recommended the use of gloves during examination and intraoral surgical procedures. The American Centers for Disease Control guidelines, however, later stipulated that examination gloves are appropriate for examination and nonsurgical procedures and surgical gloves for surgical procedures. In developing countries like India, where the money set aside for public health, is <1% of the gross domestic product (GDP), routine use of surgical gloves for examining patients as well as for minor surgical procedures can be a drain on the resources. Recently, there have been studies from developing as well as developed countries questioning the routine use of disposable, surgical gloves for such indications, but none from the subcontinent. The purpose of the present study was to ascertain whether it is necessary to use surgical gloves in routine dental extractions. Postoperatively, assessment of the extraction socket was based on the following criteria: exudate, odor, condition of surrounding mucosa of socket (normal, edematous, erythematous), pain (duration and intensity), swelling, fever (due to infection), and infected socket. 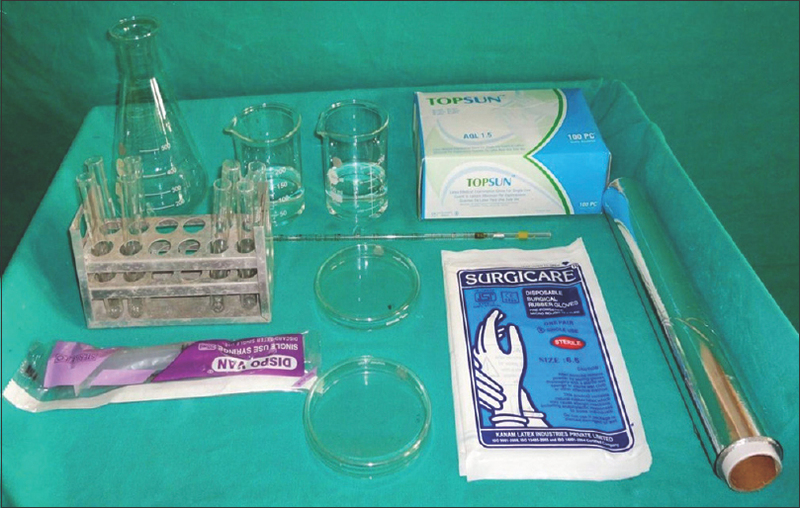 An independent assessor with no knowledge of which type of gloves were used for extractions examined the patient on the 7th postoperative day and also, for the microbiological specimens. Data of these one hundred patients were entered into Microsoft Excel sheet and subjected to Statistical Analysis using SPSS Version 20 Statistical package (IBM SPSS statistics 20 Core system software, Chicago, USA). A Paired t-test, Unpaired t-test, and Karl Pearson's Coefficient test were used to calculate the scientific data and association between variables. A P = 0.05 or less was considered as statistically significant while P = 0.001 or less was considered as statistically highly significant. The statistical analysis was done using IBM SPSS statistics 20 Core system software. Paired t-test, unpaired t-test, and Karl Pearson's Coefficient test were used to calculate the scientific data and association between variables. A P = 0.05 or less was considered statistically significant while 0.001 or less, as statistically, highly significant. A total of 100 patients who had 356 extractions were obtained at the end of the study with a mean surgical time of 16.65 min for surgical glove group and 17.06 min for examination glove group. [Table 1] shows intergroup comparison of pre- and post-operative bacterial counts (CFUs) after 24 h with the paired t-test showing highly significant difference from pre- to post-operative CFUs at 1% level of significance (P < 0.01). The patients included in the study for surgical and examination glove groups had a fair OHI-S Index and the presence of Established Destructive Periodontal Disease which all came out to be significant values. [Table 2] shows the intergroup comparison of bacterial colonies, OHI-S and Russell's Index using unpaired t-test which was statistically insignificant for all. Karl Pearson's Coefficient revealed a strong positive and significant correlation (P < 0.01) in postoperative CFUs but a weakly positive correlation in the preoperative CFUs which was again found to be statistically insignificant along with OHI-S and Russell's Index. The dropout rate of the patients who did not report for the follow-up was only 9%. Furthermore, a significant finding was that none of the patients had an infection on the 7th postoperative day in both groups [Table 3]. Gloves were introduced into surgical practice for hygiene purpose more than a century ago and have been recommended for mandatory use in surgical procedures from more than three decades. Dental extractions are common procedures in clinical practice. The vast majority of the resulting extraction wounds heal normally without adverse incidents over approximately 6 weeks. The level of glove cleanliness that may influence the postoperative infection rate in minor surgical procedures has not been properly explored. Initially, dentists resisted wearing gloves during patient treatment possibly because of fears that manual dexterity and treatment efficiency would be adversely affected. In an editorial published in the International Journal of Oral and Maxillofacial Surgery, the editor-in-chief raised this issue in the year 2001 and questioned the need to wear surgical gloves for dental extractions, especially with increasing budget constraint on medical and dental services. Only 1.4% of GDP is spent on medical and dental services in India which is among the lowest in the world. The corresponding figure for the US is in excess of 7% while European nations such as the UK, Spain, Germany, and Italy, spend around 6.5%–8% of their GDP on healthcare., Budget control is a debatable topic, especially in teaching hospitals and developing countries like India, where private institutions are unable to get grant from the respective governments. Compliance with the minor surgical procedures such as exodontia is expensive and the use of surgical gloves in all dental procedures can be impracticable. Even in developed countries, budgetary constraints have encouraged surgeons to query whether the use of surgical gloves for all dental procedures is desirable. However, if examination gloves are found not to increase the infection rate after extraction, the concept of clinical practice may have to be given a rethinking. The necessity for wearing surgical gloves in dental extractions was queried by Giglio et al. several years ago. They compared the infection rate in a group of patients who underwent removal of erupted teeth with the surgeons wearing examination gloves with a similar group treated by surgeons wearing surgical gloves and found no evidence of any significant rise in the risk of postoperative infections in either group. Also, of interest, was the fact that culture of a swab of the palm of the surgical gloves before surgery showed that 50% of the samples were already contaminated before the actual start of the procedure. Cheung et al. put forth the safe use of examination gloves in dental extraction and that the use of surgical gloves did not offer any definite advantage over examination gloves in minimizing socket inflammation, infections and alveolar osteitis following dental extractions. Another study by Chiu WK et al. evaluated the possible differences in the postoperative complication rates following lower third molar surgical procedures performed with either surgical or examination gloves. They also evaluated and compared the microbiological profile of the tooth sockets and glove surfaces and found that examination gloves for lower third molar surgical procedures in preference to surgical gloves did not increase the incidence of postoperative clinical complications. In our study, surgical as well as examination gloves used in exodontia similarly showed no significant difference in the risk of postoperative clinical complications in both groups. Ritter et al. determined contamination levels on the exterior of gloves and whether or not holes in gloves contributed to the contamination of gloves and found that the contamination rate of gloves was about the same for all scrubbed personnel; also, a double pair of gloves did not reduce the amount of contamination but did reduce the number of holes. McDaniel et al. analyzed a variety of examination gloves immediately on opening the boxes for the presence of bacterial organisms and to reexamine the remaining gloves after the boxes were put into clinical use and concluded that new examination glove boxes were remarkably free of bacterial contamination on arrival in the dental offices. Berthelot et al. investigated the bacteriological contamination of examination gloves before the boxes were opened and found that a large variety of bacteria could be isolated from examination gloves. Ferreira et al. quantified the CFUs on latex procedural gloves in the beginning, middle, and end of the opening of the boxes carrying the glove containers and evaluated the microbial load of the gloves considering time of exposure to the environment. It was emphasized that the time of exposure of gloves did not cause significant contamination. Therefore, use of examination gloves appeared to be safe from microbiological viewpoint. In our study, surgical and examination gloves were compared pre- and post-operatively in routine extraction procedures with the help of CFUs, and there was a highly significant difference between both groups. Our study is the first prospective, randomized controlled study to do a preoperative assessment of oral hygiene status and periodontal condition with the help of OHI-S and Russell's Periodontal Index., All the patients included in this study had a fair OHI-S and Russell's Index (1.3–3) with established destructive periodontal disease (1.6–5) to reduce the intergroup bias in the selection of the patients. Creamer et al. 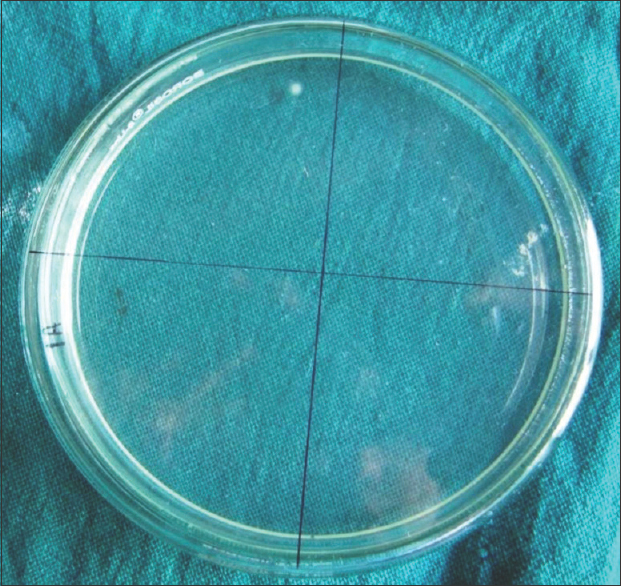 conducted a study to determine if there was a difference in bacterial CFUs on surgical versus examination gloves in an outpatient clinical setting. They came to the conclusion that there was a statistically significant difference in bacterial load on examination versus surgical gloves. However, when comparing the bacterial contamination on examination gloves with that required causing an infection as it appeared that this statistically significant difference was clinically irrelevant. Our study also supports the study as there was a highly significant difference from pre- to post-operative CFUs in both groups. Although there was a statistically significant difference in bacterial load on surgical and examination gloves, it appears that this statistically significant difference is supposed to be clinically irrelevant. The present study concluded that the use of surgical gloves did not offer an advantage over examination gloves in minimizing the rate of postoperative infections following extraction of teeth. Our study recommends that routine nonsurgical dental extractions and other examination procedures can be safely performed by surgeons wearing examination gloves without increasing the risk of postoperative infections. Furthermore, the study paves way for further studies with inclusion of immunocompromised patients since this set of patients is actually at a higher risk of contracting infections under any type of breaches in the aseptic protocols and with the possible usage of examination gloves. Ritter MA, French ML, Eitzen HE. 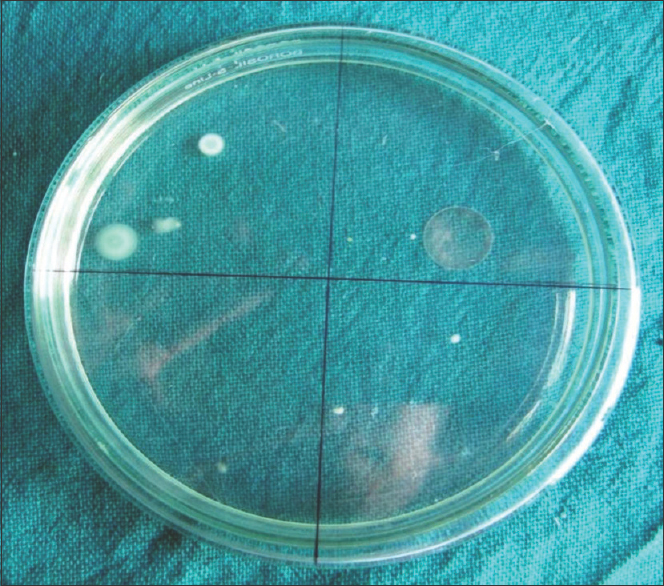 Bacterial contamination of the surgical knife. Clin Orthop 1975;108:158-60. Cheung LK, Chow LK, Tsang MH, Tung LK. An evaluation of complications following dental extractions using either sterile or clean gloves. Int J Oral Maxillofac Surg 2001;30:550-4. Available from: http://www.dnaindia.com/money/1797327/report-india-s-economic-growth-rate-in-2012-13. [Last accessed on 2013 Feb 07]. Available from: http://www.indianexpress.com/news/healthcare-spend-to-rise-to-2.5--of-gdp/918380. [Last accessed on 2012 Mar 01]. Giglio JA, Rowland RW, Laskin DM, Grenevicki L, Roland RW. The use of sterile versus nonsterile gloves during out-patient exodontia. Quintessence Int 1993;24:543-5. Soben P. Essentials of Preventive and Community Dentistry. 4th ed. New Delhi: Arya Medi Publishing House; 2011. p. 318-21. Russell AL. A system of classification and scoring for prevalence surveys of periodontal disease. J Dent Res 1956;35:350-9.